Looking at the distant star is literally looking back in time. Between the glowing blue and yellow swirls of distant galaxies, this tiny pinprick of light doesn’t look like much: a white smudge on the infinite black of the universe. But this tiny speck has enormous significance for astronomers. 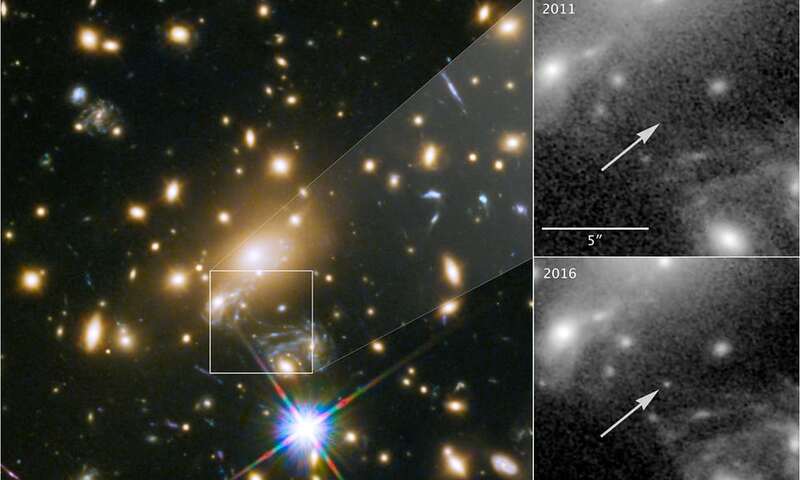 It’s the most distant star ever seen, affording astronomers a glimpse back in time. The star, MACS J1149+2223 Lensed Star 1 (more simply known as “Icarus”) was about 9 billion light years away when it emitted the light now reaching Earth. Most other objects spotted at this distance are either galaxies or exploding stars (AKA supernovas), which produce much more light than this distant glimmer. Here are four things you should know about this distant galactic neighbor, and why we’re just seeing it for the first time. Icarus is so far away that we technically shouldn’t be able to see it: it’s about 100 times further away than the most distant star telescopes have been able to view before now. Fortunately, astronomers got a little bit of help from the universe in spotting it (and the Hubble telescope, props to that). Icarus was visible because of an astronomical phenomenon called gravitational lensing. 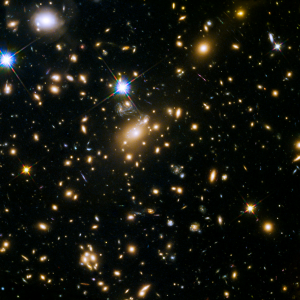 In short, the gravity of large, stacked-up celestial objects (in this case, a cluster of galaxies) bend light, creating a magnifying glass-effect for anything behind them. Overall, researchers told The Guardian, Icarus was magnified more than 2,000 times. Icarus also got a special boost from an extra-magnifying star within the galaxy cluster, making it appear four times brighter over the course of the time the astronomers studied it. Thank you, physics. Icarus would be an oddity in the universe — if it were still around. Analysis of the star’s light showed it was a blue supergiant, one of the hottest and highest-mass stars we know of; the blue supergiant Rigel A, the bright left “foot” of the constellation Orion, is 23 times more massive than the sun, and estimated to be several hundred thousand times brighter. Stars like Icarus and Rigel are rare in the universe today, but in the early universe, they were common; according to io9, most of the early stars were blue supergiants at some point in their lives. That makes sense, since Icarus’ distant light is actually somewhat like a time machine. The universe is way, way bigger than you can probably comprehend. And because of this astronomical (sorry) size, it can take a really long time for light to reach Earth from the cosmic wilderness. Even traveling at its immense speeds, by the time light from this distant star reached Earth, 9 billion years had passed. When Icarus released the photons currently hitting the Hubble’s cameras, Earth hadn’t even formed yet — it would be another 4.4 billion years before our solar system even began to coalesce from the dust of the universe. Such distant views of the universe are helping astronomers learn about what the universe was like before our time, even giving us glimpses back to the moments after the Big Bang. The Guardian reports that the team also used their view of Icarus to test a theory about dark matter, the mysterious substance that makes up 27 percent of the universe (its counterpart, dark energy, makes up another 68 percent). One theory proposed that dark matter was made of black holes, but what the researchers saw of Icarus didn’t support that theory — looking back at a decade of Hubble images, they didn’t see Icarus’ brightness vary over time. If the black-hole-dark-matter theory was correct, the star would have appeared brighter. In the coming years, scientists hope to peer even further into our universe’s history with more powerful telescopes, like the James Webb Space Telescope and the Wide Field Infrared Survey Telescope (WFIRST). Recent budget cuts from the White House threatened the future of WFIRST. If the government was unsure just how much these space telescopes could accomplish, this discovery from their predecessor might serve as an apt reminder.